The club was founded in 1887, and from the beginning hurling and football were played throughout the parish. The Club’s first entry in the roll of honour came in 1898 when Doora won the senior football championship. The first hurling championship did not arrive until 1942, while in 1943 the Junior B title was won. This club contested the senior final in 1951 but lost to Ruan. However, this team did win the championship in 1954 and repeated the success in 1958. Other titles won around this time were two Clare Champion Cups ‘53 and ‘57; and two junior A titles in ‘52 and ‘60. The club provided several players to the county panel at this time , notably, Matt Nugent, Johnny Purcell, Donal O Grady, Mick Hayes and Gerry Browne. 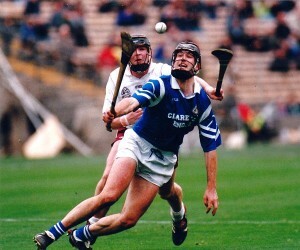 The 1990s proved to be the golden era for hurling in the Club. The minor A title was won in 1990, two U/21 titles in ‘93 and ‘94, and the intermediate title in ‘93 all paved the way for major successes later in the decade. St Josephs, now a senior team, contested two Co finals, in 1994 and 1997, losing to Clarecastle in both. In 1998 St Josephs defeated Kilmaley to win their first senior title since 1958 captained by Lorcan Hassett. They continued their success in Munster, beating Mount Sion and Toomevara and after a famous win over Athenry they qualified to meet Rathnure in the final. March 17th 1999 was a glorious day in Croke Park and St Josephs were crowned All Ireland Club Champions after a comprehensive victory. This team won County and Munster again in 1999 but lost to Athenry in the final at Croke Park. St Josephs returned to win the County final again in 2001. This has remained the last senior championship won, but Junior titles have been won in the meantime. The Club has contributed very significantly too to the great success of Clare hurling and football during the 90s and after. James O Connor, Ollie Baker, Sean Mc Mahon and Lorcan Hassett were heroes of ‘95 and ‘97 and David Hoey and Ken Kennedy in later years. Ken also won an All Ireland Minor with Clare in 1997 along with Daragh O Driscoll and Martin Brooks. Kieran O Neill and James Hanrahan played in the great Clare team of 1992, winning a Munster senior title. Football has provided much success to the club over the years. In 1989 the junior title was won and in 1997 the intermediates were successful. Both finals were played against O’Currys. At under age level, u /14 s won championships in 1997 and 1998. The minor A championship was won with victory over Eire Og in 2001 and most recently in 2009 the u21s won honours by defeating Kilmurry Ibrickane in the final. In 2010 the Club captured the Minor A title overcoming Ennistymon in the final.